Two young owl brothers named Soren and Kludd are captured and taken to an evil army who intend on brainwashing them into soldiers. By fate, Soren escapes and with the help of a few new friends travels to the legendary island of Ga'Hoole where he intends to alert the Guardians of the wrong doings going on by the evil Metalbeak and his queen Nyra. 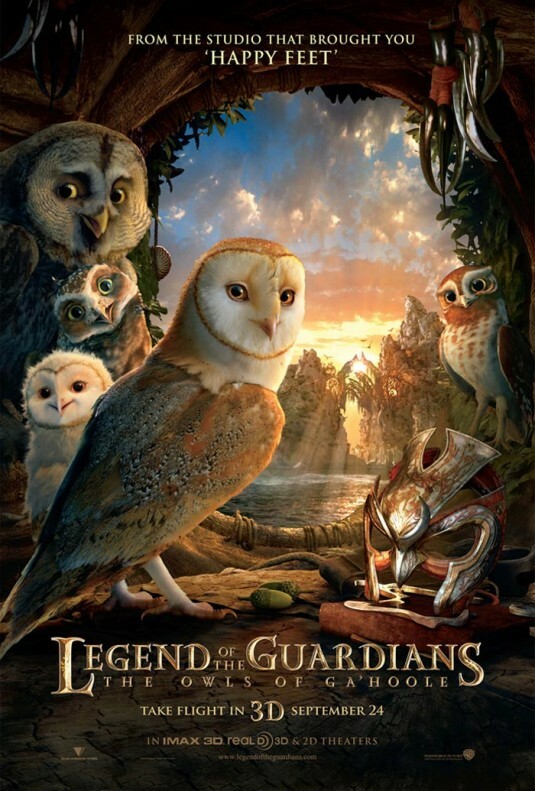 "Legend of the Guardians: The Owls of Ga'Hoole" is the first animated movie where I forgot I was watching a cartoon. Well sorta, obviously I'm watching owls talk so I know I'm within a fantasy world, but the imagery and owls are so lifelike and natural it is real easy to find yourself swept away into Ga'Hoole. One of many aspects that make 'The Owls of Ga'Hoole' such a fantastic animated film is its sense of adventure. Like so many other epic adventure movies before it, 'Ga'Hoole' has all the right components to whisk the viewer into the world and keep their attention throughout. Regardless of the fact that we are following owls, I became completely invested in their struggle. I wanted to see these little owls live out their adventure. What's even better is I wanted more. The animated motion picture is based off the first three books in a series of over fifteen, so hopefully we'll get to see more flying and further adventures from Ga'Hoole. It should be noted that by no means does this film feel incomplete. Director Zack Snyder and screenwriters John Orloff and Emil Stern found a nice place to end the film making it both complete and leave room to continue the story if Warner Brothers sought to continue the franchise. 'Legend of the Guardians' has an impressive sense of scope. The film really only has about 3 main locations throughout the 97 minute feature yet it feels as though it covers a ton of ground. Sure some of this has to do with all the flying, but overall the film feels grandiose and epic in nature while still being very simple in concept and story structure. The animation probably helps the scope as well, which is absolutely breathtaking. Not only are the owls amazing, but so too are the locations. I loved both camps of owls. The massive tree the Guardians controlled is stunning and vibrant while the cliffs that the Pure Ones resided in were gloomy and dark. The animators do a remarkable job with the two opposing sides of owls. The Guardians personified light and good while the Pure Ones were the exact opposite representing dark. This immediately gave the younger audience members a sense of who to trust within the film while also giving way to some incredible animation designs. I loved the way the color red was played with among the Pure Ones and reversely with the Guardians, golds were used. The play with colors by the animators was a subtle and smart way to give viewers visual clues to plot developments that were probably otherwise in the original books. Like every Zack Snyder movie, there is a healthy dose of what I like to call Snyder-vision. Which is of course Snyder's signature trick. Where he slows down a sequence to highlight it in slow-motion. Let me just proclaim now how perfect the flight sequences are with Snyder-vision. We get a good 30 minutes of flying and slow-mo sequences that are simply eye-widening. Not only is the flying animation mesmerizing, so too is all the battles. I loved seeing the owls go head-to-head or talon-to-talon in this case. The Snyder-vision in all of the fighting is just as well paced and timely as it was in Snyder's 300. The animators deserve a healthy round of applause for their ability to make all of the flights and battles so intense and thrilling not to mention handle Snyder's style. Going in I was worried that "Legend of the Guardians: The Owls of Ga'Hoole" would be too kiddie and not very adult friendly. Glad to say my worries were all for not. The animated tale has an ideal blend for both young and older audiences. There is enough meat to keep parents engaged and the material is not too dark that young children will get scared. The film is dark and has some sinister moments although, but is never too heavy handed with the darker elements. The only thing I found to be a little too much of a mood lightener was the work song montage. Now I'm all for a work song montage and I actually liked the song by Owl City but at the end of the day it was simply unnecessary. The song actually ended up being the only moment throughout the adventure that pulled me back into the real world for a moment. In closing the review I have to talk shortly about the exceptional voice cast and character development. Everyone involved is a hoot (sorry I had too). I loved hearing voices like Helen Mirren, Sam Neil, Geoffrey Rush, Joel Edgerton and Hugo Weaving. The character development is actually fairly distinguished for an animated tale. There is comic relief, compassion, heroism as well as sinister or evil motives and it all comes together quite brilliantly. Finally 'Legend of the Guardians' is a animated featured I had very high expectations for and thankfully they were met. It is a feature that I look forward to seeing again and one that will definitely become a permanent fixture in our home.